The new TSA series is specific for automotive field and can work no woven insulating material. Unique of its kind, the slitter TSA can unwind reels of 2 and more meters width, and diameter up to 1300 mm and cut and rewind narrow band of diameter up to 1200 mm. Independent unwinding group “shaftless” Motorized system to separate the bands just slit. 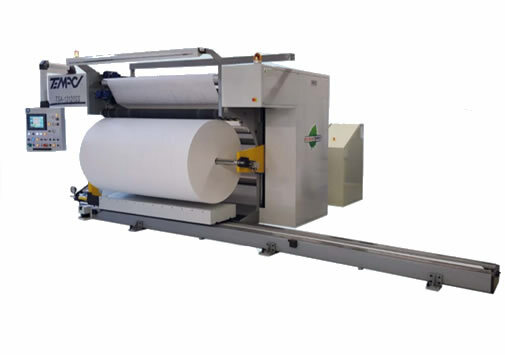 Semi-automatic ended rolls pushing out system integrated in the robotized unloading Trolley group managed by servo motor and full digital inverter. All machine controls are managed by wide colour “Touch Screen” unit. Digital servo vector inverters manages all A.C. Asynchronous Motors. Machine is able to store all work parameters as “work menus” for an extremely quick and sharp machine setting. High speed serial communication network controls all hardware units as PLC, “Touch Screen”, Inverter for a total remote control, able to ensure a data interchange with the customer’s management software (INDUSTRY 4.0 approved).